Verdict: 3.75 / 5Taking readers in Unexpected directions, this series has hit its stride and it's all the more fun for it. The Unexpected has already taken many twists and turns, with the shocking death of half of the team in the first issue. The third instalment of this title starts to feel like the writers have gotten into a groove, finding the right pace and voice for this brand new series. Becoming a sort of tour of the DC Universe, now that we have become far more familiar with our heroes, many of the teething problems have been smoothed out. Using the first two issues to start to build a foundation might have cost the narrative in quality early on, however, the benefits of doing this are now being reaped. Heading to a mechanic, June, she points them into Monster Valley, where they can find another isotope; a metal rod that once belonged to the Orcks that ruled the Earth before man. Upon finding this, the heroes of this story are finally introduced to their pursuer and antagonist, Synn. We learn that he is still weak, although replenished slightly by the rod that is found. Having a villain with a weakness like this is very different. Whilst many just want to conquer, there is a desperation here that perhaps makes him far more dangerous. A desperation that seems somewhat shared, especially by Firebrand, who wishes for a normal life. Having a villain with a weakness like this is very different. Meanwhile, Neon is still mourning the loss of his teammates. Already exhibiting signs of mental health struggles in The Unexpected #2, this has continued into issue 3, as he struggles to deal with his grief and anger, briefly turning it on Firebrand. It is a flash of emotion that is becoming more common for Neon the Unknown. However, it is starting to allow readers to understand the emotional turmoil that he has gone through. It is interesting that Neon can create portals to keep moving as he seems to be the sort of person who doesn’t want to stop moving, nor does he want to look back. 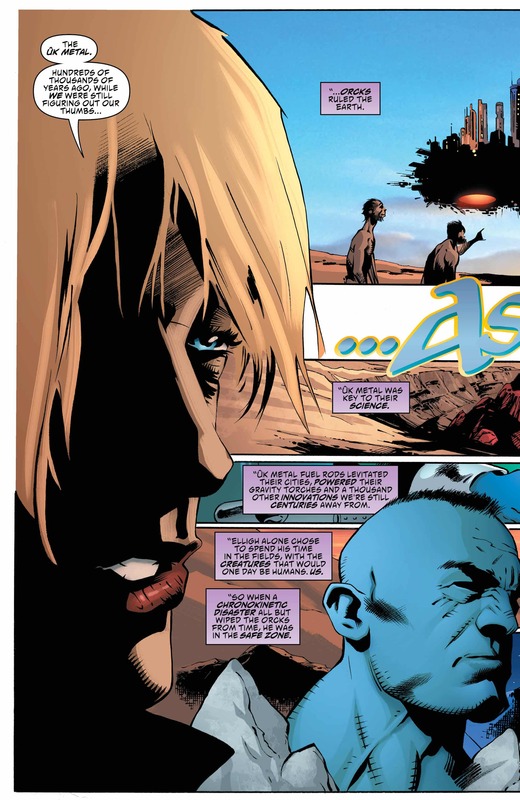 Firebrand also appears to be a parallel to this, anxious to return to Gotham in the final pages of the book, due to it being the place of her death. It appears that the next chapter of this roller coaster ride is indeed taking us to the Bat’s city. Gotham is home to many famous characters, some of which are very likely to cross over with Neon and Firebrand. This series is unique in giving us a new pair of eyes to view this fantastical universe through. You’ll notice in the background of this issue that there was a robot Robin, which may be a tease of what is to come. In the meantime, the Huntress has been introduced to our heroes, with us not knowing whether she is about to act as friend or foe. This is a nice ending to this chapter, with the series heading in a very clear direction now, tracking down each element in a race against their rival. The series has hit a stride now, with the art matching accordingly. As it continues to gather momentum, we’ll likely get to see more famous locations and potential cameos. Becoming a lot more fun, The Unexpected is earning its name, with the potential for all sorts of scenarios being able to play out in this book.